Verlage, E. et al. A Monolithically Integrated, Intrinsically Safe, 10% Efficient, Solar-Driven Water-Splitting System Based on Active, Stable Earth-Abundant Electrocatalysts in Conjunction with Tandem III-V Light Absorbers Protected by Amorphous TiO2 Films. Energy & Environmental Science, DOI: 10.1039/C5EE01786F (2015). A >10% efficient, stable, unassisted solar-driven water-splitting in a monolithic photoelectrochemical system integratingprotected tandem junction photoabsorbers, earth-abundant electrocatalysts, and anion exchange membranes. This work demonstrates that protection layers significantly improved the stability of efficient III-V tandem photoelectrodes, that produce thephotovoltage needed to sustain efficient, unassisted hydrogen production. The fully integrated architecture minimizes transport losses and enables efficient and safe operation. A photoelectrochemical cell consisting a of GaAs/GaInP2/TiO2/Ni photoanode connected to a Ni-Mo coated counterelectrode exhibits unassisted solar-driven water-splitting for 80 h of continuous operation at 1 Sun illumination in 1.0 M KOH(aq), with hSTH = 10.5%. 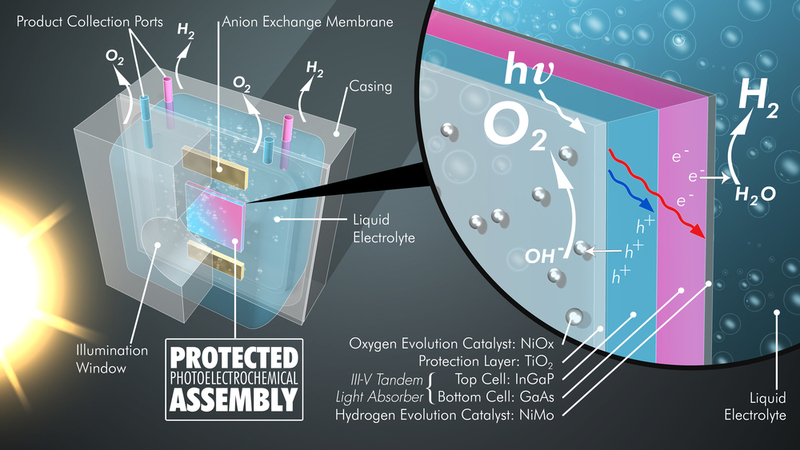 This monolithically integrated, intrinsically safe, membrane-based, wireless solar-hydrogen prototype system has an active area of 1 cm2 and has sustained unassisted solar-driven water-splitting with hSTH= 8.6% while producing fully separated streams of H2(g) and O2(g).